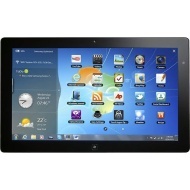 alaTest has collected and analyzed 194 reviews of Samsung Series 7 11.6" Slate. The average rating for this product is 4.0/5, compared to an average rating of 4.5/5 for other products in the same category for all reviews. Reviews about the apps and size are generally positive. The design and performance also get good feedback. The camera and storage get less positive views, while there are mixed comments on the touch screen and screen. We analyzed user and expert ratings, product age and more factors. Compared to other products in the same category the Samsung Series 7 11.6" Slate is awarded an overall alaScore™ of 86/100 = Very good quality. The Series 7 is fast and powerful enough to replace a travel laptop, but with a price this high and battery life this short, it's best suited for businesses with very specific needs. Samsung has packed an entire Intel Core i5 laptop into a slim, light slate tablet. Too bad it had to pack a fan in there, too. The Samsung Series 7 Slate fills the gap between wimpy Windows tablets and clunky convertible laptops, providing a powerful processing and portable solution. Laptop capabilities in a tablet form factor. Core i5 CPU and 4GB of RAM. 128GB SSD. No tether or storage for stylus. Without the dock and keyboard, the tablet loses some of its functional appeal. Samsung's Series 7 Slate is a powerful touch-screen Windows 7 PC, with a very Windows-8-like optional interface. Onscreen typing is finicky and headache-inducing. The sold-separately dock and keyboard are practically required. The Samsung Series 7 Slate 700T is the fastest Windows 7 tablet we've tested, and paired with its optional accessories, it provides a very laptop-like experience, but one marred by the typical awkward onscreen Windows typing experience. These days whenever someone mentions the word “Tablet” visions of the iPad or something similar dance in their heads. Not that long ago a tablet was something quite different: a Windows-based slate computer. I’ll have a full review up for you soon. What would you like to know about the Series 7 Slate? Tablet PCs are a dying breed, and Windows 8 is still at least a year away. Until we see what Microsoft's next operating system has to offer, one tablet PC shows us why this form factor is still a winner. Samsung's Series 7 11.6" Slate breaks the mold. This powerful tablet has a beautiful, large 11.6-inch screen and runs Windows 7 respectably well. Consider it if you need the power of Windows in a tablet that can convert into a laptop via accessories, but mind the hefty weight and price. I found the unit to somewhat unusable without the clunky keyboard and mouse. IF you carried those items you have more junk/weight than a laptop to lug around. In all it was just never a pleasant user experience in Win 7 or Win 8.